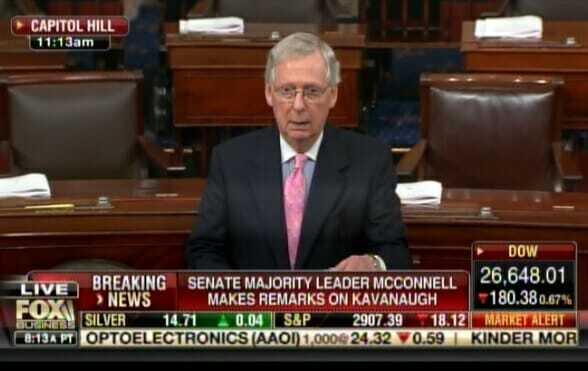 Senate Majority Leader Mitch McConnell (R-KY) spoke on the Senate Floor on Thursday morning following the release of the FBI investigation on Judge Brett Kavanaugh. The supplemental FBI investigation was delivered to the US Senate early Thursday morning. Sen. Mitch McConnell: The fact is none of these allegations have been corroborated by the FBI. Neither the Judiciary or FBI could find ANY witness to corroborate the allegations. No backup from any witnesses… This is the United States of America! Nobody is supposed to be guilty until proven innocent in the United States of America!… This is embarrassing to the Senate. The Senate should not set a fundamentally un-American precedent… Brett Kavanaugh is totally qualified for this job.